I am so excited to be working with Smile Brilliant to give one of you lovely readers a free electric toothbrush of your own! All you have to do is follow me on instagram and fill out the form below! For an extra entry, you can also follow Smile Brilliant! Everyone who enters will receive a 20% coupon code just for entering so honestly everyone wins! Simply message me or comment on my Smile Brilliant Instagram photo once you have entered and I will send you the discount code! My whole life I have always struggled with my dental health. Sadly I was not blessed with strong enamel so making daily efforts like flossing and using mouth wash is not only important but also necessary. I used to floss at least once a day growing up but part way through College, I got super lazy and just stopped. One of my New Year’s Resolutions was to get back into the habit of flossing every night which I’m proud to say I have kept up! Up until now I have been brushing my teeth with basic plastic toothbrushes that I buy from Target. I often feel like I need to replace them because I will squish the bristles from vigorously brushing to get all of the food out from between my teeth. It was also hard to judge how long to brush my teeth for and honestly, i was probably cutting the time short. 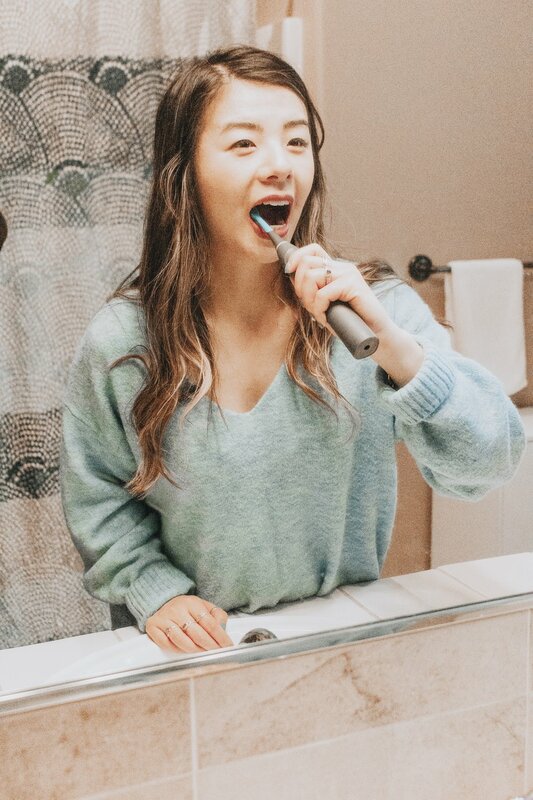 When Smile Brilliant reached out about their cariPRO Ultrasonic toothbrush, I was super stoked to try it out! In my opinion, the first 3 settings were all too aggressive and caused toothpaste to go flying everywhere! After brushing my teeth the first time with this brush, I was feeling pretty discouraged because of how difficult it was to move around in my mouth while still retaining any of the toothpaste. As I moved down the 5 options, I ended up really liking the Gum Care and Sensitive settings! The toothbrush manual recommends doing 30 seconds in each quadrant of your mouth (bottom right, bottom left, top right and top left). When I saw that the brush stays on for 2 minutes, I was kind of worried about what a long time that was! By splitting it up into 30 second segments, it makes the time go by SO fast! Now I actually find myself wishing it went longer sometimes! Another worry I had was figuring out when to spit. At first I tried spitting during the 30 second period which, combined with the first 3 powerful settings, meant most of my toothpaste ended up all over my hair. I finally got the hang of it and now I either spit during the brief pause or I will wait to spit at the end of the two minutes. The biggest differences I noticed was how well the toothbrush cleaned and how smooth my teeth feel. I always floss before brushing and am able to get rid of most of the food that way. Since using this brush, I will notice that it removes pieces of food that my floss wasn’t able to get to. Before, all of that food was staying stuck between my teeth but now I am able to get it out! I also love how smooth and clean my teeth feel afterwards! Throughout the day I can feel when my teeth are dirty because they will not feel perfectly smooth. I also love how little effort it now takes to brush my teeth. Before I felt like I was constantly moving my arm in a repeated brushing motion which did get a little tiring! With the electric toothbrush, since it moves on its own, all I have to do is move it across my teeth slowly while it does the rest of the work.